The Vollrath 40813 vacuum sealer bags come in a pack of 100. They are intended to be used with the Vollrath 40858 out-of-chamber vacuum pack machine. These bags are made of micromesh that is BPA free and is 3.9 millimeters thick. 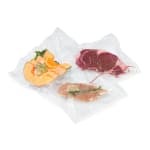 Although they are made for sous vide cooking, Vollrath 40813 vacuum sealer bags should not be used to store liquids. The maximum temperature these bags should reach is 158 degrees Fahrenheit. Overall Dimensions: 8 in. x 12 in.